In a Vase on a Monday: All dried up! It’s Monday and it has gone cold. Autumn has set the forest around us on fire as oak, hornbeam and sweet chestnut put on their shiny golden autumn robes. 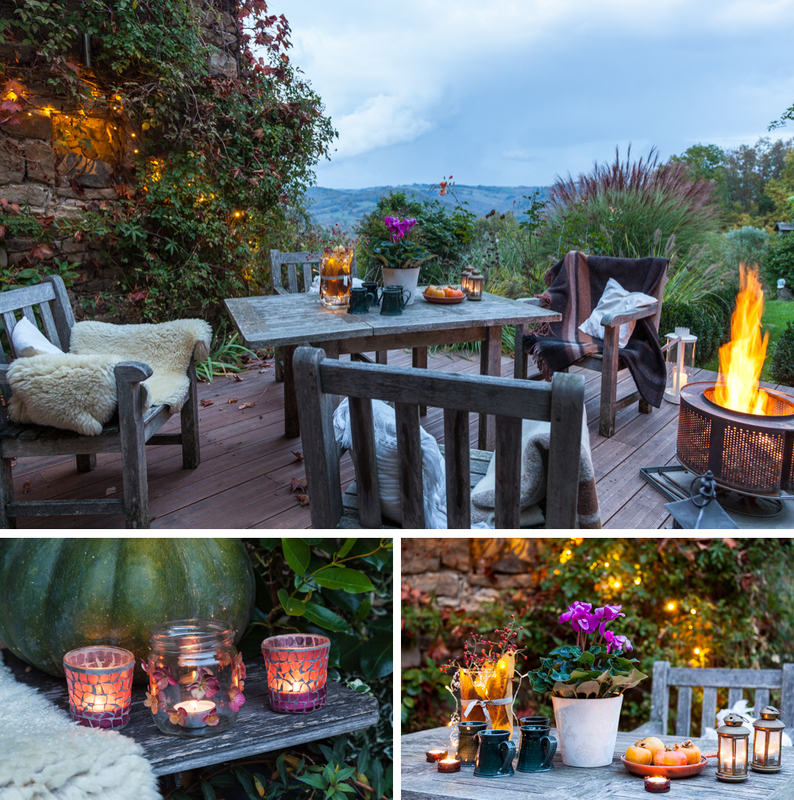 Time to light a fire and the candles and get comfy with a hot drink on the terrace! As for hot drink, you can’t beat a „sheep dip“, our favourite winter drink when we lived in Ireland: Just take hot milk and add some Whiskey (Irish of course!) and honey and voilà, pure bliss. Tastes good with a touch of cinnamon too. This week’s vase features dried up bits: a vase wrapped in pressed golden leaves filled with hips and fairy lights. Thanks to Cathy for hosting the charming IAVOAM – visit her and be inspired 🙂 Hope you find time to put the pre-xmas hustle aside to enjoy your autumn garden. Two things before I go: My photography workshop program for 2018 is now online. Please check it out and spread the word, it’s going to be fun. Last but not least, the Garden Media Guild Awards took place last week. It’s the most important event in the industry and I was short-listed for the Gordon Rae Photographer of the Year Award! I was thrilled to bits. Clive Nichols won in the end but to have reached the final round made me very happy indeed. As you all know by now, I’m very passionate about my work so this is tremendously rewarding. Wishing you all a relaxing pre-xmas season! Es ist Montag und kalt. Der Wald um uns herum steht in Flammen, nun da Eiche, Hainbuche und Eßkastanie ihr glänzendes, goldenes Herbstgewand angelegt haben. Zeit für ein Feuer, Kerzenlicht, ein heißes Getränk und Gemütlichkeit auf der Terrasse! Was das heiße Getränk angeht, so lieben wir den „sheep dip“ aus unseren Tagen in Irland: Heiße Milch, Whiskey (Irischen natürlich!) und Honig, reine Wonne. Schmeckt auch fein mit einem Hauch Zimt. In meiner Vase seht ihr heute passend zur Saison „Vertrocknetes“: Um die Vase legte ich gepresste, goldene Blätter und füllte sie mit Hagebutten und einer Lichterkette. Vielen Dank an Cathy, die die charmante Montagsvase ins Leben gerufen hat – besucht sie und lasst euch inspirieren 🙂 Ich hoffe, ihr findet in der hektischen Vorweihnachtszeit Momente, um euren Garten zu genießen. Zwei Dinge noch zum Schluß: Das Programm für meine Fotografie-Workshops 2018 ist jetzt online. Schaut doch mal rein und sagt es weiter, es wird eine tolle Sache. Last but not least waren letzte Woche die Garden Media Guild Awards in London. Dabei handelt es sich um das wichtigste Event in der grünen Branche, und ich war dieses Mal nominiert für den Gordon Rae Photographer of the Year Award! Ich war ganz aus dem Häuschen. Clive Nichols gewann am Ende, aber die Tatsache, in die letzte Runde gekommen zu sein, hat mich doch sehr glücklich gemacht. Wie ihr alle mittlerweile wisst, liebe ich meine Arbeit inbrünstig, und somit ist das eine schöne Anerkennung. Ich wünsche euch allen eine entspannte Vorweihnachtszeit! The icy cold weather arrived here today too; some kind of hot drink sounds perfect. You’re brought to mind Iris coffee, I haven’t drunk one in years but tomorrow I might just treat myself!!! That’s if I can remember how to make it. Pretty idea for your vase. If it is going to be this cold a few festive treats and arrangements are needed to cheer us through. Just made one the other night, it’s delicious. Es ist sooo gemütlich bei Dir und ich weiß jetzt, was mir noch fehlt: eine alte Laterne als Windlicht!! Der Garten ist ziemlich nass, aber trotzdem gehen wir doch immer mal hinaus, um die Piepmätze zu füttern und zu schauen, ob hier und da noch etwas blüht! I like the glass encased by leaves. Such a pretty effect. Your terrace looks so inviting with attention to every detail and views near and far. Congratulations on the recognition of your photography work. Have a happy week. wie romantisch und schön, deine Herbststimmung. Hier ist schon Winter. Alles ist weiss. Das wärmen deine Bilder meine Seele auf! What a charming idea, Annette – and how wonderful to be on that shortlist…well done!! Thanks, Cathy, it certainly gave me a kick seeing my name next to the big names…who’d have thought it?! 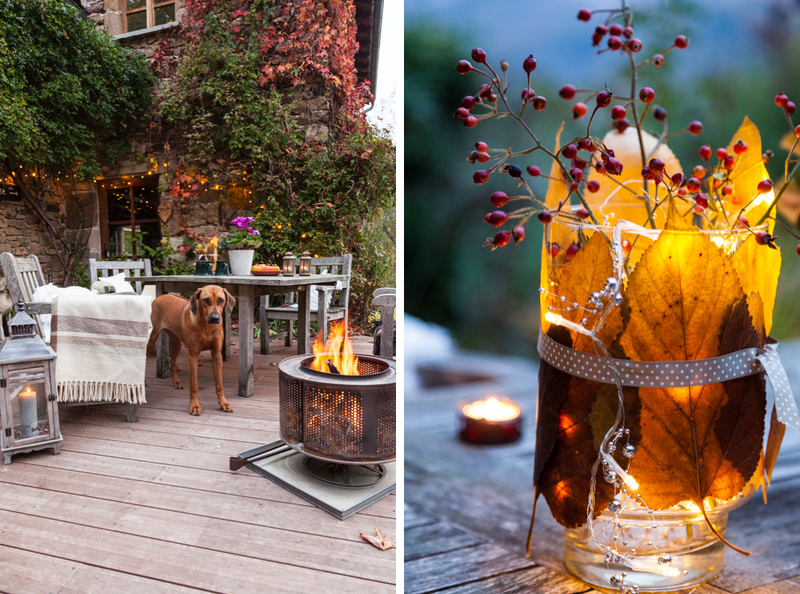 Your terrace looks very cozy, and I love the idea of wrapping autumn leaves around a votive candle – it’s warming (along with those whiskey drinks!). Congrats on your nomination, very exciting and with time and practice, you’ll top the list! Your terrace looks like the perfect place to hang out with a hot beverage, Annette! I love your tea light. Congratulations on being short-listed for the photography award – well done! Das sieht so einladend bei Euch aus, da starre ich lieber auf den Bildschirm als aus dem Fenster und Du würdest auch nicht tauschen wollen. Schade, dass es in London nicht ganz geklappt hat, vielleicht nächstes Jahr? Herzlichen Glückwunsch zur Nominierung, auch wenn’s nicht ganz geklappt hat. Vielleicht wird es beim nächsten Mal. Ich finde deine Fotos jedenfalls immer ganz wunderbar. Tja und der Ausblick von hier (Berlin) auf eure Terrasse ist auch sehr schön stimmungsvoll. Ich fühl mich gleich ein bischen wie im Urlaub. Congratulations and I’m excited for you! You’re too kind, Frank, thanks a lot. Came across some pics the other day actually and the difference is quite something. Maybe one day I’ll do an album. Have a good w-e, wonder if it has gone cold over at your end too? Not cold today, it’s warmed up again and we’ll enjoy it while we can! Oh well done, what an achievement! Well deserved of course, your photography is amazing. Your terrace looks wonderful; so inviting. I wish I could join you there for a sheep dip. You’ve uncovered so much beautiful color in the grayest of months! 🙂 Congratulations on the short-list – so well deserved! And I had to go check your workshop; I do wish travel and such were possible for me, that would be a dream… Hope you have a lovely day in a wonderful season! Congratulations on your being a finalist. From what I see in your blog, it is very well deserved. Liebe Annette, herzliche Glückwünsche – Deine Bilder sind wirklich wunderschön. So einen sheep dip auf Deiner Terrasse … das wäre direkt eine Maßnahme. 🙂 Ich schaue gleich mal zu Deinen Workshops rüber, es war mir nicht klar, dass Du sowas auch machst. Herzlichen Dank, liebe Doris, mittlerweile ist’s recht frostig geworden, aber wir können den Sheep dip auch in meinem weihnachtlich geschmückten Wohnzimmer einnehmen 🙂 Hab ein schönes Wochenende!